Wave-particle duality does not mean that a photon or subatomic particle is both a wave and particle simultaneously, but that it could manifest either a wave or a particle aspect depending on circumstances. Complementarity, uncertainty, and the statistical interpretation of Schroedinger's wave function were all related. Together they formed a logical interpretation of the physical meaning of quantum mechanics known as the "Copenhagen interpretation. The wave function is a complete description of a wave/particle. Any information that cannot be derived from the wave function does not exist. For example, a wave is spread over a broad region, therefore does not have a specific location. When a measurement of the wave/particle is made, its wave function collapses. In the case of momentum, a wave packet is made of many waves each with its own momentum value. Measurement reduced the wave packet to a single wave and a single momentum. If two properties are related by an uncertainty relation, no measurement can simultaneously determine both properties to a precision greater than the uncertainty relation allows. So, if we measure a wave/particles position, its momentum becomes uncertain. Central to the Copenhagen Interpretation is the principle known as complementarity. That the wave and particle nature of objects can be regarded as complementary aspects of a single reality, like the two sides of a coin. An electron, for example, can behave sometimes as a wave and sometimes as a particle, but never both together, just as a tossed coin may fall either heads or tails up, but not both at once. One must resist the temptation to regard matter or photon waves as waves of some material substance like sound or water waves. The correct interpretation, proposed by Born in the 1920's, is that the waves are measures of probability. Waves of probability relate to the uncertainty principle in that it cannot be certain what any given particle will do. Only betting odds can be given. This fundamental limitation represents a breakdown of determinism in nature. It means that identical electrons in identical experiments may do different things. But, statistically, the outcome of the experiment is predictable. Bohr, the leader of the Copenhagen Interpretation, admonished those who would ask what an electron really is, a wave or a particle. He denounced the question as meaningless or without context (such as `what is north of the north pole?'). To observe the properties of an electron is to conduct some sort of measurement. Experiments designed to measure waves will see the wave aspect of electrons. Those experiments designed to measure particle properties will see electrons as particles. No experiment can ever measure both aspects simultaneously and so we never see a mixture of wave and particle. The adoption of the Copenhagen Interpretation for quantum phenomenon poses a sharp divide between classical or macroscopic physics and quantum or microscopic physics. In the macroscopic world events appear to be deterministic. Every event has a cause. Often, the cause is difficult to directly determine, for example an apple falls from a tree because its stem weakens. We cannot tell exactly when it will fall, but we know some direct mechanical action is the cause and if we had precise knowledge of the state of its fibers we would know when and why. Thus, we resort to probabilities as a substitute for exact knowledge of the acting causes. However, the conceptual abyss seems to separate classical from quantum physics. In the quantum world, probabilities are not a substitute for detailed knowledge of hidden, relevant details; there are no relevant details, just pure chance. The classical world is determinism, the quantum world is pure probabilist. And, the probabilism nature to quantum physics has been confirmed by numerous experiments. In general, quantum theory predicts only the probability of a certain result. Consider the case of radioactivity. Imagine a box of atoms with identical nuclei that can undergo decay with the emission of an alpha particle. In a given time interval, a certain fraction will decay. The theory may tell precisely what that fraction will be, but it cannot predict which particular nuclei will decay. The theory asserts that, at the beginning of the time interval, all the nuclei are in an identical state and that the decay is a completely random process. Even in classical physics, many processes appear random. For example, one says that, when a roulette wheel is spun, the ball will drop at random into one of the numbered compartments in the wheel. Based on this belief, the casino owner and the players give and accept identical odds against each number for each throw. However, the fact is that the winning number could be predicted if one noted the exact location of the wheel when the croupier released the ball, the initial speed of the wheel, and various other physical parameters. It is only ignorance of the initial conditions and the difficulty of doing the calculations that makes the outcome appear to be random. In quantum mechanics, on the other hand, the randomness is asserted to be absolutely fundamental. The theory says that, though one nucleus decayed and the other did not, they were previously in the identical state. Many eminent physicists, including Einstein, could not accept this indeterminacy. They have rejected the notion that the nuclei were initially in the identical state. Instead, they postulated that there must be some other property--presently unknown, but existing nonetheless--that is different for the two nuclei. This type of unknown property is termed a hidden variable; if it existed, it would restore determinacy to physics. If the initial values of the hidden variables were known, it would be possible to predict which nuclei would decay. Such a theory would, of course, also have to account for the wealth of experimental data which conventional quantum mechanics explains from a few simple assumptions. For example, the electron would definitely have to go through only one slit in the two-slit experiment. To explain that interference occurs only when the other slit is open, it is necessary to postulate a special force on the electron which exists only when that slit is open. Such artificial additions make hidden variable theories unattractive, and there is little support for them among physicists. The Copenhagen view of understanding the physical world stresses the importance of basing theory on what can be observed and measured experimentally. It therefore rejects the idea of hidden variables as quantities that cannot be measured. The Copenhagen view is that the indeterminacy observed in nature is fundamental and does not reflect an inadequacy in present scientific knowledge. One should therefore accept the indeterminacy without trying to "explain" it and see what consequences come from it. The many possibilities carried by quantum superpositions are spread out over space and time. However, Newtonian physics is an accurate description of ordinary experience. What is the relationship between the strange quantum world and the classical world of common sense? Clearly the difference occurs when we measure or observe a quantum system. Whatever the process, it occurs at that time. The ``how and why'' of this process is unsolved and many believe modern physics will be incomplete until it is resolved. By the 1950's, the ongoing parade of successes had made it abundantly clear that quantum theory was far more than a short-lived temporary fix. And so, in the mid 1950's, a Princeton graduate student named Hugh Everett III decided to revisit the collapse postulate in his Ph.D. thesis. Everett's idea is known as the relative-state, many-histories or many-universes interpretation or metatheory of quantum theory. Dr Hugh Everett, III, its originator, called it the "relative-state metatheory" or the "theory of the universal wavefunction", but it is generally called "many-worlds". Many-worlds is a re-formulation of quantum theory which treats the process of observation or measurement entirely within the wave-mechanics of quantum theory, rather than an input as additional assumption, as in the Copenhagen interpretation. Everett considered the wavefunction a real object. Many-worlds is a return to the classical, pre-quantum view of the universe in which all the mathematical entities of a physical theory are real. For example the electromagnetic fields of James Clark Maxwell or the atoms of Dalton were considered as real objects in classical physics. Everett treats the wavefunction in a similar fashion. Everett also assumed that the wavefunction obeyed the same wave equation during observation or measurement as at all other times. This is the central assumption of many-worlds: that the wave equation is obeyed universally and at all times. Quantum systems, like particles, that interact become entangled. If one of the systems is an observer and the interaction an observation then the effect of the observation is to split the observer into a number of copies, each copy observing just one of the possible results of a measurement and unaware of the other results and all its observer copies. Interactions between systems and their environments, including communication between different observers in the same world, transmits the correlations that induce local splitting or decoherence into non-interfering branches of the universal wavefunction. Thus the entire world is split, quite rapidly, into a host of mutually unobservable but equally real worlds. According to many-worlds all the possible outcomes of a quantum interaction are realised. The wavefunction, instead of collapsing at the moment of observation, carries on evolving in a deterministic fashion, embracing all possibilities embedded within it. All outcomes exist simultaneously but do not interfere further with each other, each single prior world having split into mutually unobservable but equally real worlds. Worlds, or branches of the universal wavefunction, split when different components of a quantum superposition "decohere" from each other. Decoherence refers to the loss of coherency or absence of interference effects between the elements of the superposition. For two branches or worlds to interfere with each other all the atoms, subatomic particles, photons and other degrees of freedom in each world have to be in the same state, which usually means they all must be in the same place or significantly overlap in both worlds, simultaneously. For small microscopic systems it is quite possible for all their atomic components to overlap at some future point. In the double slit experiment, for instance, it only requires that the divergent paths of the diffracted particle overlap again at some space-time point for an interference pattern to form, because only the single particle has been split. Such future coincidence of positions in all the components is virtually impossible in more complex, macroscopic systems because all the constituent particles have to overlap with their counterparts simultaneously. Any system complex enough to be described by thermodynamics and exhibit irreversible behaviour is a system complex enough to exclude, for all practical purposes, any possibility of future interference between its decoherent branches. An irreversible process is one in, or linked to, a system with a large number of internal, unconstrained degrees of freedom. Once the irreversible process has started then alterations of the values of the many degrees of freedom leaves an imprint which can't be removed. If we try to intervene to restore the original status quo the intervention causes more disruption elsewhere. There is no "where" for cat, not even both true, wave function is the description of the cat. The worlds already exist, there is no spliting. Does anything really new ever come about in physics? Are properties or characteristics of things ever created or evoked ``from nothing''? Emergence is a view that holds the answer to these questions to be, in some very important sense, yes. Emergence is the rise of a system that cannot be predicted or explained from antecedent conditions. George Henry Lewes, the 19th-century English philosopher of science, distinguished between resultants and emergents--phenomena that are predictable from their constituent parts and those that are not (e.g., a physical mixture of sand and talcum powder as contrasted with a chemical compound such as salt, which looks nothing like sodium or chlorine). The evolutionary account of life is a continuous history marked by stages at which fundamentally new forms have appeared: (1) the origin of life; (2) the origin of nucleus-bearing protozoa; (3) the origin of sexually reproducing forms, with an individual destiny lacking in cells that reproduce by fission; (4) the rise of sentient animals, with nervous systems and protobrains; and (5) the appearance of cogitative animals, namely humans. Each of these new modes of life, though grounded in the physicochemical and biochemical conditions of the previous and simpler stage, is intelligible only in terms of its own ordering principle. These are thus cases of emergence. A property is said to be emergent if it cannot be defined or explained in terms of the properties of its parts or if it is not reducible to these properties and relations. Classical physics is reductionist. But, quantum entities have emergent properties. Things like position and energy simply do not exist until they are measured or observed (i.e. until the wave function collapses). They exist as potentialities, but can not explain the properties of the actualities. In this sense, quantum entities have a whole that is greater than the sum of its parts. And the reverse is true, that nothing can ever be wholly reduced to the sum of its constituent parts. This is the holistic nature of the quantum world, with the behavior of individual particles being shaped into a pattern by something that cannot be explained in terms of the Newtonian reductionist paradigm. Newtonian physics is reductionist, quantum physics is holistic. Holism as an idea or philosophical concept is diametrically opposed to atomism. Where the atomist believes that any whole can be broken down or analyzed into its separate parts and the relationships between them, the holist maintains that the whole is primary and often greater than the sum of its parts. The atomist divides things up in order to know them better; the holist looks at things or systems in aggregate and argues that we can know more about them viewed as such, and better understand their nature and their purpose. The early Greek atomism of Leucippus and Democritus (fifth century B.C.) was a forerunner of classical physics. According to their view, everything in the universe consists of indivisible, indestructible atoms of various kinds. Change is a rearrangement of these atoms. This kind of thinking was a reaction to the still earlier holism of Parmenides, who argued that at some primary level the world is a changeless unity. According to him, "All is One. Nor is it divisible, wherefore it is wholly continuous.... It is complete on every side like the mass of a rounded sphere." In the seventeenth century, at the same time that classical physics gave renewed emphasis to atomism and reductionism, Spinoza developed a holistic philosophy reminiscent of Parmenides. According to Spinoza, all the differences and apparent divisions we see in the world are really only aspects of an underlying single substance, which he called God or nature. Based on pantheistic religious experience, this emphasis on an underlying unity is reflected in the mystical thinking of most major spiritual traditions. It also reflects developments in modern quantum field theory, which describes all existence as an excitation of the underlying quantum vacuum, as though all existing things were like ripples on a universal pond. Where atomism was apparently legitimized by the sweeping successes of classical physics, holism found no such foundation in the hard sciences. It remained a change of emphasis rather than a new philosophical position. There were attempts to found it on the idea of organism in biology - the emergence of biological form and the cooperative relation between biological and ecological systems - but these, too, were ultimately reducible to simpler parts, their properties, and the relation between them. Even systems theory, although it emphasizes the complexity of aggregates, does so in terms of causal feedback loops between various constituent parts. It is only with quantum theory and the dependence of the very being or identity of quantum entities upon their contexts and relationships that a genuinely new, "deep" holism emerges. Every quantum entity has both a wavelike and a particlelike aspect. The wavelike aspect is indeterminate, spread out all over space and time and the realm of possibility. The particlelike aspect is determinate, located at one place in space and time and limited to the domain of actuality. The particlelike aspect is fixed, but the wavelike aspect becomes fixed only in dialogue with its surroundings - in dialogue with an experimental context or in relationship to another entity in measurement or observation. It is the indeterminate, wavelike aspect - the set of potentialities associated with the entity - that unites quantum things or systems in a truly emergent, relational holism that cannot be reduced to any previously existing parts or their properties. If two or more quantum entities are "introduced" - that is, issue from the same source - their potentialities are entangled. Their indeterminate wave aspects are literally interwoven, to the extent that a change in potentiality in one brings about a correlated change in the same potentiality of the other. In the nonlocality experiments, measuring the previously indeterminate polarization of a photon on one side of a room effects an instantaneous fixing of the polarization of a paired photon shot off to the other side of the room. The polarizations are said to be correlated; they are always determined simultaneously and always found to be opposite. This paired-though-opposite polarization is described as an emergent property of the photons' "relational holism" - a property that comes into being only through the entanglement of their potentialities. It is not based on individual polarizations, which are not present until the photons are observed. They literally do not previously exist, although their oppositeness was a fixed characteristic of their combined system when it was formed. In the coming together or simultaneous measurement of any two entangled quantum entities, their relationship brings about a "further fact." Quantum relationship evokes a new reality that could not have been predicted by breaking down the two relational entities into their individual properties. The emergence of a quantum entity's previously indeterminate properties in the context of a given experimental situation is another example of relational holism. We cannot say that a photon is a wave or a particle until it is measured, and how we measure it determines what we will see. The quantum entity acquires a certain new property - position, momentum, polarization - only in relation to its measuring apparatus. The property did not exist prior to this relationship. It was indeterminate. Quantum relational holism, resting on the nonlocal entanglement of potentialities, is a kind of holism not previously defined. Because each related entity has some characteristics - mass, charge, spin - before its emergent properties are evoked, each can be reduced to some extent to atomistic parts, as in classical physics. The holism is not the extreme holism of Parmenides or Spinoza, where everything is an aspect of the One. Yet because some of their properties emerge only through relationship, quantum entities are not wholly subject to reduction either. The truth is somewhere between Newton and Spinoza. A quantum system may also vary between being more atomistic at some times and more holistic at others; the degree of entanglement vary. Where a reductionist believes that any whole can be broken down or analyzed into its separate parts and the relationships between them, the holist maintains that the whole is primary and often greater than the sum of its parts. Nothing can be wholly reduced to the sum of its parts. The highest development of quantum theory returns to the philosophy of Parmenides by describing all of existence as an excitation of the underlying quantum vacuum, like ripples on a universal pond. The substratum of all is the quantum vacuum, similar to Buddhist idea of permanent identity. Quantum reality is a bizarre world of both/and, whereas macroscopic world is ruled by either/or. The most outstanding problem in modern physics is to explain how the both/and is converted to either/or during the act of observation. Note that since there are most probable positions and energy associated with the wave function, then there is some reductionism available for the observer. The truth is somewhere between Newton and Parmenides. The neutrino is a type of fundamental particle with no electric charge, a very small mass, and one-half unit of spin. Neutrinos belong to the family of particles called leptons, which are not subject to the strong nuclear force. There are three types of neutrino, each associated with a charged lepton--i.e., the electron, muon, and tau. 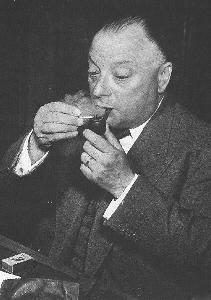 The electron-neutrino was proposed in 1930 by the Austrian physicist Wolfgang Pauli to explain the apparent loss of energy in the process of beta decay, a form of radioactivity. It seemed that examination of the reaction products always indicated that some variable amount of energy was missing. Pauli concluded that the products must include a third particle, but one which didn't interact strongly enough for it to be detected. The Italian-born physicist Enrico Fermi further elaborated (1934) the proposal and gave the particle its name, the neutrino which meant "little neutral one". An electron-neutrino is emitted along with a positron in positive beta decay, while an electron-antineutrino is emitted with an electron in negative beta decay. Neutrinos are the most penetrating of subatomic particles because they react with matter only through the weak interaction. Neutrinos do not cause ionization, because they are not electrically charged. Only 1 in 10 billion, traveling through matter a distance equal to the Earth's diameter, reacts with a proton or neutron. Electron-neutrinos were first experimentally observed in 1956 by monitoring a volume of cadnium chloride with scintillating liquid near to a nuclear reactor. A beam of antineutrinos from a nuclear reactor produced neutrons and positrons by reacting with protons. All types of neutrino have masses much smaller than those of their charged partners. For example, experiments show that the mass of the electron-neutrino must be less than 0.0004 that of the electron.